Roxane Ferguson's office is decorated with one of her quotes and a map of downtown Middletown. 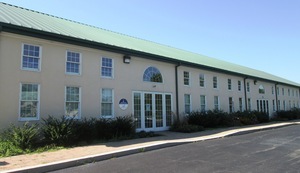 In May, the Middletown Chamber of Commerce moved out of the historic Academy Building into a bright, modern office building on North Cass Street with a plan to help fledgling businesses thrive. Now the business incubator is almost full, and the chamber might have to expand its operation as the Middletown boom continues. "We've exceeded our expectations," said Roxane Ferguson, the chamber's executive director. "It's a good problem to have." With big-box stores and national chains sprouting all around Middletown, the Chamber of Commerce wanted to make sure that smaller, in-home businesses weren't pushed aside. The idea of offering a professional workspace to small businesses isn't unique to Middletown, but the town's spin on the concept has done better than anyone expected back in May. "We realized we needed to do something with a business incubator because we were getting so many calls from entrepreneurs who wanted to come to the area, and we were just sending them to commercial brokers," Ferguson said. "We met with the New Castle County Chamber at their enterprise center, we went to the Coin Loft in Wilmington, which is more of a collaborative workspace, and then we went up to Walnut Street Labs in Chester County. Incubators were designed to give entrepreneurs the resources they need for mentorship, networking, helping them grow their business. We already had that infrastructure in place," Ferguson said. What some businesses need is start-up capital and mentorship, but some are just fine and only need a place to meet clients that's not around the family dining table. "Perhaps they have a home office but they need a place to meet a client, grab coffee, check email. Starbucks gets awfully crowded," Ferguson said. "Some businesses need a mailing address that's outside of their home. If you have a construction business, for instance, you don't want people to just come to your home. What we do is provide a professional environment so people can conduct business. "This building was initially a real estate office, and what we were able to do is get a grant from Home Depot, get some in-kind services from local contractors to bring this together within our budget," Ferguson said. "This building is a 10,000-square-foot facility, and we lease 3,500 square feet." The other two suites in the huge building are not finished, but Ferguson said the chamber is eyeing them for future expansion. "We currently have 12 different businesses that use the facility," Ferguson said. "All of our offices are rented out. We have a grant writer, Computer Mechanics, Tender Loving Care childcare has their corporate offices here, and an IT firm has its office here. They each have their own key and a passcode for the building, so they can come and go as they please. "We also have folks who come in once a week. We have an insurance company, a payroll services company, Stanley Builders, and then we have several companies, like May Kay or realty firms that rent our offfice space for workshops and seminars." The Chamber of Commerce charges small businesses a very fair rent -- $350 per month instead of $1,200 per month in one case Ferguson cited -- and clients get everything they need. For a cubicle space, it's only $150 per month. "This gives them a chance to learn the cycle of business," Ferguson said. "For the new folks, they can use the office supplies, and they purchase their own office equipment -- a desk, chair, that sort of thing. If they need capital, we have seminars. From a networking and growth perspective, the chamber already has three to five mixers and ribbon cuttings and so forth every month." Each business gets an online dashboard that they can customize to reach their customers. The chamber's website gets about 70,000 hits a month, Ferguson said, so business couldn't be better. "It's all here," Ferguson said. "The incubator is the first one of its kind below the canal. We now have folks who are in a business development role and they travel the state of Delaware. This is an ideal location for them to drop in, check email, make a phone call or two, take a break, and find out what's new in the area." For now, there are one-year leases for businesses, but there's no set time limit for leaving the incubator. "Those who want to grow and go, so to speak, we definitely want to help them do that," Ferguson said. "For those who want to stay, we have that environment already built in. It's kind of a win-win. Our goal is that they start here and we help them to move out to one of the other opportunities that Middletown has to offer." Ferguson came up with a striking design for the space, which feels open, airy and bright. On the walls are stenciled quotes to inspire entrepreneurs. Ferguson's office displays one of her own, and in the Founders Room where meetings can be held, there are quotes from each of the past presidents of the chamber. In September, the chamber will be opening the Community Room and making it available to area groups, and an internship program will be extended to local high schools to find a receptionist who can greet visitors when Ferguson or office manager Peg Ryan can't be on site. "Middletown is an economic hub right now for the state, and it's great to be able to live and work in this community," Ferguson said. For more information, visit www.maccde.com.